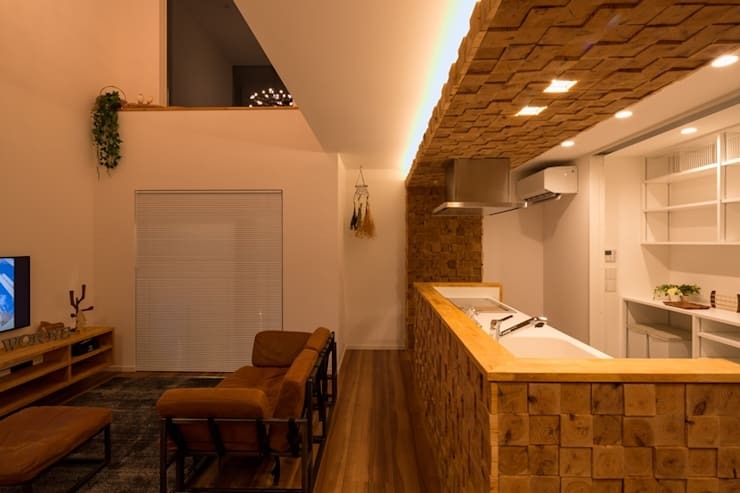 Amidst an otherwise nondescript, Japanese neighbourhood basks this beautiful abode, the creation of Little Nest Works Architects. This home is sure to please the eye, with its crisp, white form and subtle sense of elevation showcasing an engaging design, exuding modern style and sophistication. The exterior of the abode intrigues, despite its subtlety, with two white, galvanised steel panels skirting an array of generously proportioned, central windows, enhancing the sense of elevation and flow defining the facade. The interior is equally splendid, with its stark, white decor warmed by timber finishes used throughout the floors, doors and kitchen. Indeed, the kitchen presents one of the most pleasing design elements within this lovely dwelling, with the space having been finished in array of multi-layered, timber tiles, providing a contrast of colour and texture amidst its flowing, white surrounds. 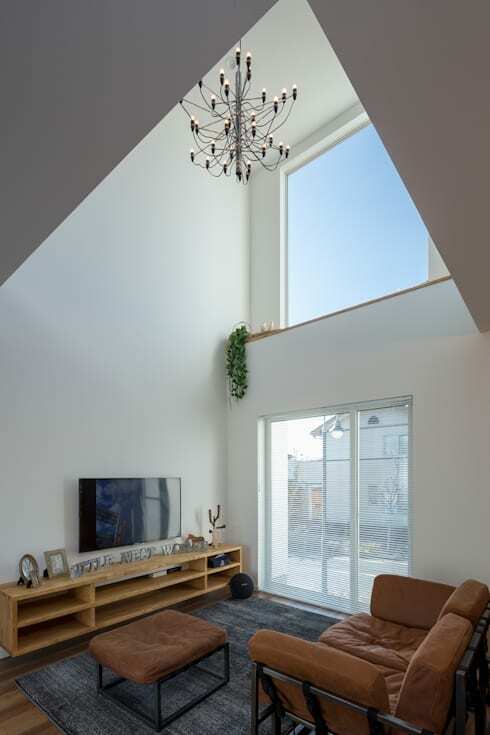 The upper level is also beautifully lit, and appears spacious and inviting by virtue of a streamlined mezzanine corridor, which looks down upon the living quarters, amalgamating the upper and lower levels of the home. A unique, floor-to-ceiling, wire balustrade fulfils the home's safety requirements, while still allowing light and air to circulate upstairs, infusing the bedrooms with a tranquil air. This is a fabulous design for anyone wishing to create a family home with a spacious air and plenty of modern style. Take a tour below and tell us what you think! From this outside this home impresses with its stylish, modern design, as its bi-level structure streams upwards, presenting a crisp, elevated form. The white facade of the abode gleams beneath the overhead sun, catching the eye and inviting us to examine the galvanised steel panneling skirting the home's central windows. The windows are expansive, allowing light and to filter inside in fine weather and illuminate the spacious living quarters within. Moving through to the home's interior and we're met with an open plan design, with white decor to promote a light and lofty atmosphere. High ceilings tower overhead in the living room, with a modern chandelier hanging above, presenting a unique design element within the space. Light flows in through the home's central windows, bouncing about the interior and illuminating an array of stylish, casual furnishings, such as the modern leather couch seen here. Bordering the living space is a unique kitchen area, finished in an array of multi-layered, wooden tiles which provide a contrast of colour and texture. The wooden tiles add a modern edge to the home's otherwise stark exterior, with their inclusion displaying a considered and sophisticated design feature. White decor flows behind the timber alcove, with an array of shelves and cabinets built in for storage, while spotlighting has been included overhead to provide functional illumination after dark. The home's bathroom is also decorated in light tones, with its white walls and ceilings paired with pale, grey tiles for a bright and breezy effect. A vanity of pale timber supports a stylish, contemporary sink unit, while a lengthy, gold gilt mirror streams above, adding a classic edge to the room. 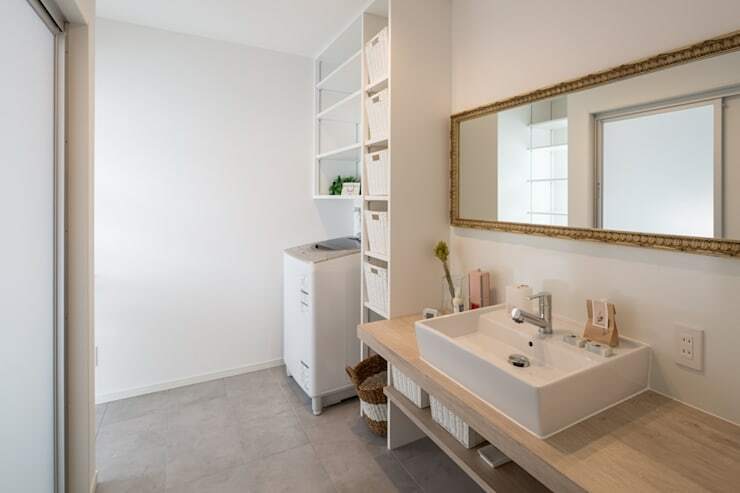 A generous array of shelves and drawers have been included in the bathroom, with the space also doubling as a laundry, as evidenced by the small washing machine sitting in a built-in, corner alcove. Moving upstairs and we're embraced the home's open second level, which exudes simple, modern style with its white walls and flowing, timber floors. 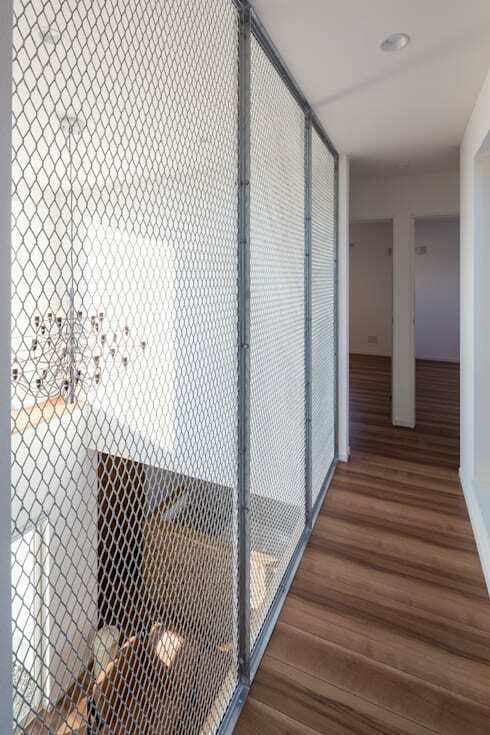 This level houses the home's bedrooms, each enclosed for privacy, and connected through the use of a mezzanine corridor, which streams above the ground floor. Floor-to-ceiling, wire balustrades have been included, providing a safety for those upstairs while still allowing light and air to circulate throughout the entire property, amplifying its spacious atmosphere. If you enjoyed the understated style of this lovely abode, take a tour of The Sleek Grey Layered Home for more design inspiration! 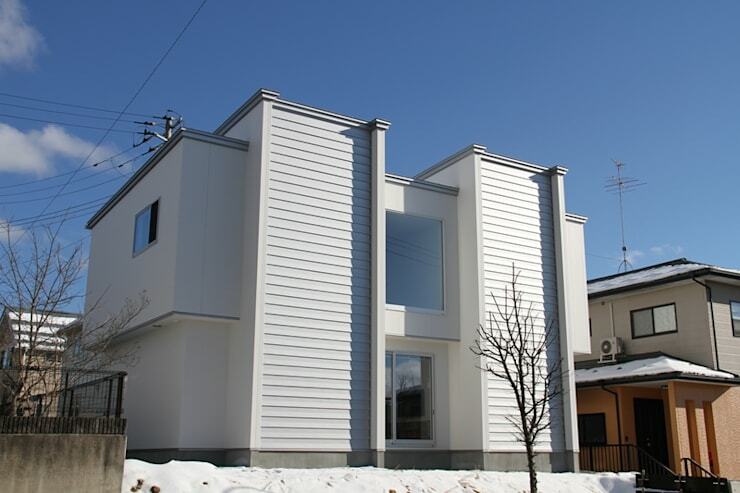 Do you like the white facade of this lovely abode, or do you prefer a more colourful palette? Tell us below!